Whether you are a man or woman, losing your hair can be a traumatic experience. For many, hair is more than just what sits at the top of your head; it is part of your identity. Losing a piece of what makes you who you are will never be easy for anyone to deal with. While there are shampoos and treatments designed to hinder the progression of hair loss, they are not always effective since a cure for hair loss has yet to be invented. Despite the lack of having a cure, hair transplant surgery has proven to be an effective treatment that can provide long-lasting results, giving you a thicker and fuller head of hair. What Are the Requirements for Hair Transplant Surgery? People who are already completely bald will not be able to undergo this procedure since hair transplant surgery makes use of existing hair already on your head. Therefore, you will need to have healthy growth on both the sides and back of your head in order to be considered as a candidate for this result. The sides and back of your hair will become the donor locations and, depending on the technique used, may be trimmed or even shaved to transport to the thinning or balding area. Other requirements for candidacy include being a healthy individual whose hair loss is not caused by a medical condition. 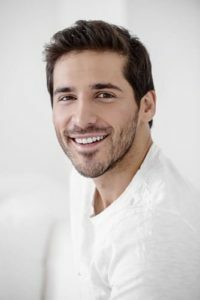 There are two techniques offered for hair transplant surgery, and Dr. Diamond will discuss which one is better for you during your consultation. This technique is more commonly used in patients that have a higher degree of hair loss. In this procedure, the donor hair on the sides and back of the head is trimmed but not shaved, and the surrounding hair is left intact. Dr. Diamond and his team can recreate a natural-looking pattern and thickness in your thinning areas with the FUT technique. This technique is generally used for patients with a smaller degree of hair thinning or loss and involves shaving the back of the scalp as well as above the ears. This allows the extraction sites to remain hidden entirely once the shaved areas regrow. Just like the follicular unit transplantation, Dr. Diamond can expertly create and design the hairline to look natural and full. For many patients, hair is one of their favorite features. Why lose it before you have to? Hair loss can affect both men and women of any age. Hair transplant surgery can restore your youthfulness and self-confidence for years to come. If you are bothered by thinning and balding areas, hair transplant surgery may be right for you. Call Dr. Diamond today at 310-859-9816 to set up a consultation.